Join us this Saturday for the 4th Annual Ticket to Ride at the Jittery Joe's Roaster, 425 Barber Street, Athens, GA. The ride starts at 9 a.m.
Sign-up now on Active.com (which will really help us know how many more riders to plan for) or visit our webpage for the waivers, cue sheets, and maps for the 15-, 40-, 60-, or full 85-mile out-and-back. Beat the crowd and register and/or pick up your wristband, socks, and goodie bag on Friday the 20th at GA Cycle Sports from 5-7 p.m. (1029 Baxter St.). Register and/or pick up your goodies the day of the ride at the Jittery Joe's Roaster at 8 a.m. (425 Barber St.). Mayor Denson will be on hand to send the riders our promptly at 9 a.m.! Post-ride party planning is in high gear! Terrapin casks are ready to go, Your Pie pizzas are waiting to be cooked, the North Georgia Bluegrass Band is warming up, SAG food is being purchased, and the GreenScapes goodie bags are being filled. Raffle prizes from Athens Orthopedics' Sports Performance & Rehabilitation Center (SPARC), Fitness @ Five 24/7 gym, Your Pie pizza (dinner for 8), and Jittery Joe's roasted coffee goodness are ready to be won. The party starts at noon with the raffle drawing, music until 2 p.m., and Terrapin beer until 4:30 p.m., when ride support ends. Riders (21 & older), show your wristband to get your first beer free! We would cordially like to invite you to the 4th Annual Firefly Trail Ticket to Ride, a bicycle event and educational fair on Saturday, March 21st, to raise funds and awareness for creation of the Firefly Trail. We are pleased this year to have Athens-Clarke County Mayor Nancy Denson to send the riders off! We are sure that 2015 will prove to be our most exciting year to date as Athens-Clarke County plans to begin construction from East Broad Street almost to the Athens Loop. When complete, this segment of the trail will be 14 feet wide and will include two bridges - the first, spanning Wilkerson Street and the North Oconee River, and the second carrying the trail over Peter Street. The ACC SPLOST team is in negotiations with CSX to purchase even more abandoned right-of-way and get the trail to the other side of the Loop. As you know, the Firefly Trail is a proposed 39-mile rail-trail from Athens to Union Point, roughly following the route of the historic Athens Branch of the Georgia Railroad. Based on participation at our three previous events, we expect up to 250 bicyclists will ride in support of the rail-trail and the opportunities it will provide to enhance economic development, health, recreation, transportation, and historic preservation in our communities. • Athens – 8:00-9:00 a.m.
• Winterville Depot – 9:30-11:00 a.m.
• Maxeys City Hall – 10:30-11:30 a.m.
• Historic Union Point Theater – 11:30 a.m.-12:30 p.m.
We will also host a celebration for returning riders, starting at 12 noon at the Roaster. Thank you for all you do in support of the Firefly Trail and the great communities it will serve. Along with the Board of our non-profit organization, Firefly Trail, Inc., I look forward to seeing you at the Ticket to Ride on March 21. Member and Past President, Firefly Trail, Inc.
Support a great cause and join us for another incredible bicycling trip up and down the proposed route of the Firefly Trail. We depart at 9:00 a.m. on Saturday, March 21st (rain or shine) from the NEW Jittery Joe's Roaster, 425 Barber Street in Athens where parking is free and plentiful. The $30 registration fee includes a pair of quality Firefly biking socks, a 1 year membership in Firefly Trail, Inc., and 1 Terrapin Beer pour (21 & older). The party starts at noon at the roaster with music from the North Georgia Bluegrass Band, Terrapin beer and Your Pie pizza for sale. All registered riders will also receive a GreenScapes goodie bag filled with cool stuff, including a Fitness@Five water bottle and Jittery Joe's coffee, as well as a chance to win one of these awesome raffle prizes! A private dinner for 8 at a Your Pie where owner, Drew French, will personally teach the group how to toss dough and make their own pizzas....along with beer, wine and gelato! A chance at one of three 30 day gym memberships at Fitness @ Five, 24 hr. access gym in 5 Points! A chance at one of two 30 day membership at SPARC (Sports Performance & Rehabilitation Center) from Athens Orthopedic Clinic! A can of Jittery Joe's coffee, "micro-roasted, nationally boasted"! A SWAG bag from Terrapin Beer Company! A custom filled basket from the Habitat ReStore full of some cool vintage goodies! Choose your distance to Winterville (15 miles round trip), Crawford* (40 miles round trip), Maxeys (60 miles round trip) or Union Point (the full 85 miles) making this a perfect ride for cyclist of all interests and abilities. All routes are fully supported with great food and restroom facilities. Check out the details at FireflyTrail.com, where you can print a waiver and mail it with your check (cue sheets to be posted soon) or sign up at Active.com. *Due to ongoing construction at the historic Crawford depot our Crawford SAG location has been moved to Almar Self Storage, 154 S Broad Street. Special thanks to owner, Darryl Johnson, for allowing us to use his wonderful facility! Have a great time watching the riders pull in to "your" SAG stop! Short 2 hour time slots are available in Winterville and Crawford where help is needed keeping the refreshments for the riders flowing. This great video highlights two examples of rails-to-trails projects. Hear the people involved with the Swamp Rabbit Trail in Greenville, SC and the Virginia Creeper Trail in Damascus, VA, tell what these trails have done for these communities. Ecusta Trail, Brevard NC from Real Digital Productions, LLC on Vimeo. 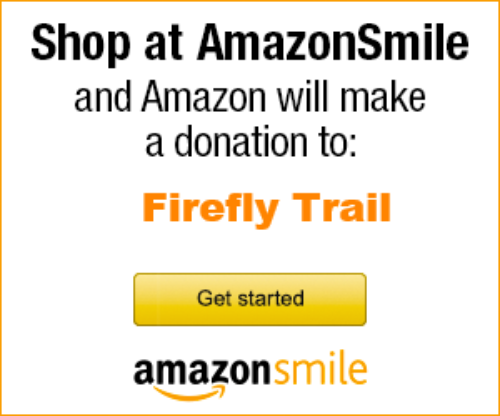 When you shop at AmazonSmile, Amazon will donate to Firefly Trail! Same products, same prices, same service. It's quick and free. Simply click to update your regular or Amazon Prime account!